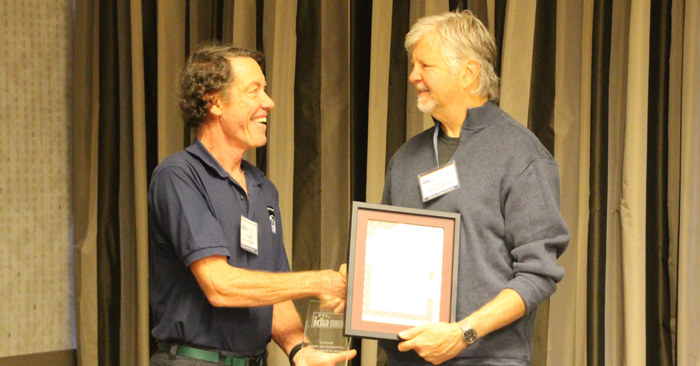 IDA Board President Jim Dougherty recognizes outgoing IDA Board Member Jim Benya for for his years of service to IDA. IDA is excited to welcome four new elected board members. Each new member brings unique perspectives, talents and backgrounds to our organization. We are so grateful for their willingness and passion to serve IDA’s mission. See their biographies below. We are also happy to report that Jim Dougherty, our current board president, was reelected. Jim has been a great asset to IDA and we’re thrilled that he’ll continue contributing his knowledge and inspiration. We’re sadden to announce the stepping down of Jim Benya, Chris Kyba, Mario Motta and Scott Roberts. They each contributed considerable knowledge and their expertise to IDA during their time on the board. They will greatly missed, although as friends of IDA, they won’t be strangers. Jim Benya (PE, FIES, FIALD, LC), principal of Benya Lighting Design’s, has been on the board for more than a decade. As a member of the technical committee, he has used his lighting design expertise to help shape the Fixture Seal of Approval program and the IDA/IES Model Lighting Ordinance. He was also involved in the decision by Davis, California, to remove 4000K white LED lights and replace them with 2700K white LED. Chris Kyba, Ph.D., a postdoctoral researcher at the German Research Center for Geosciences in Potsdam, Germany, has served on the board for three years. Chris, physicist and light pollution researcher, has been a been a huge resource through his research monitoring sky glow and his participation in the Loss of the Night Network, a part of the European Union Cooperation in Science and Technology (“COST”) Framework Program. He was recently honored, along with other members of the Sudbury Neutrino Observatory Team, with the 2016 Breakthrough Prize in Fundamental Physics. Mario Motta, M.D., a cardiologist with North Shore Cardiovascular Associates in Salem, Massachusetts, has been on the board for seven years. Mario’s expertise on artificial light at night and human health has been a large asset to IDA. He was a key player in the AMA’s 2009 resolution supporting reduction of light pollution at the state and national levels and the AMA 2012 report on the impact of artificial light at night on human health. Darcie Chinnis has been in the lighting design industry since 2005. She has been a contributing author for whitepapers, lighting standards, and energy codes and prime author for multiple peer-reviewed journal articles. Darcie has designed indoor and outdoor lighting for a range of applications, including hospitality, corporate campus, office, multifamily residential, retail, convention centers, and performing arts venues. She has been an invited speaker for national conferences and events, with topics ranging from the Model Lighting Ordinance, to “green” lighting design, to advanced lighting controls. Darcie holds a Bachelor of Science Degree in Architectural Engineering, a Master of Science Degree in Civil Engineering, and a Doctorate in Architectural Engineering, all with a focus on illuminating engineering, building energy systems, and sustainable design from the University of Colorado at Boulder. She currently serves on the Technical Review and Research Administration Committees for the Illuminating Engineering Society, and is a LEED Accredited Professional with the US Green Building Council. Kim has an M.S. in Environmental Planning from the University of Arizona and brings 10 years of experience managing projects and programs in conservation, renewable energy, and distributed data systems both nationally and internationally. She has held leadership positions in science organizations including the Arizona Geological Survey and the International Dark-Sky Association. Her experience includes managing and conducting research on a more than $30m portfolio, including Co-Principal Investigator on a $3.6m National Science Foundation cooperative agreement and project manager of a $22m U.S. Department of Energy funded project. Currently she works in research development at a Research 1 institution. Her passion is in connecting science and policy; while at IDA she helped organize the first Washington, DC based symposium on the protection of the night sky resulting in a series of congressional briefings before both the U.S. House of Representatives and the Senate. Kellie Pendoley has been wrestling with the mysteries of measuring and monitoring light pollution for over 25 years. In her role as an environmental practitioner she has worked with the oil and gas, mining and ports industries to better minimize and manage their light pollution and to protect nearby marine turtle rookeries from negative impacts of Artificial Light at Night (ALAN). Kellie’s Public Service includes memberships of various international and local boards and committees. She holds a BSc in Environmental Science and an MSc in Oceanography from the Florida Institute of Technology (Florida USA), and a PhD in Biology from Murdoch University (Australia). Kellie is actively involved in the development of biologically-meaningful light measuring equipment, as well as research to improve understanding of the impacts of light on seabirds and marine turtles. With this knowledge, Kellie routinely provides advice to regulators, engineers and managers towards improving industrial and urban lighting. She routinely publishes in the scientific literature, has presented on ALAN, and associated biological impacts, at five recent International Sea Turtle Society annual conferences, and was invited to lead a workshop on light and marine turtles at the ‘2014 IUCN Indian Ocean – South East Asia (IOSEA) Marine Turtle Memorandum of Understanding’ meeting in Bonn. Kellie has presented at all three ALAN Conferences and the most recent Light Pollution Theory Modelling and Measurement Conference.